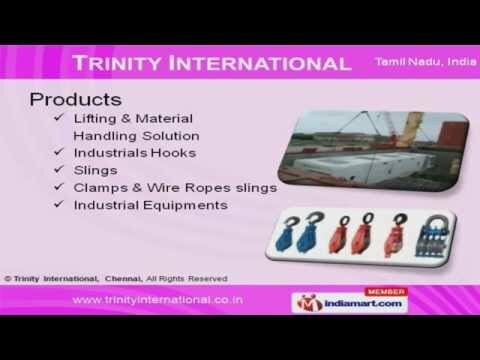 Welcome to Trinity International, Exporter & Supplier of Lifting & Material Handling Equipments & Accessories. The company was established in the year 2002, at Chennai. Our Ultra Modern manufacturing plants and Capacious warehousing facility help us to grab various clients across the globe. Industry leading prices, Rigorous quality checks and Maximum clientâs satisfaction help us to achieve an unrivalled position in the industry. We offer a huge gamut of Slings, Industrials Hooks and Equipments. Lifting & Material Handling Solution offered by us are extremely reliable. Industrials Hooks offered by us are widely acclaimed in the market. We also provide Slings that are available at affordable prices. Our Clamps & Wire Ropes Slings are best in the industry amongst others. We are instrumental in offering our clients a wide range of Industrial Equipments that are in huge demand across the global markets.